Ever notice black spots or grime on and around the vents for your air conditioning? How do you clean that? Wait, put down the scrub brush! By yanking open moldy vent covers and scrubbing on them inside your home, you could be spewing mold spores everywhere. What are you to do? Stop procrastinating! Contact Green Star Eco Services. Our employees are licensed by the state of Texas for mold remediation. Ask us to gauge the depth of the problem. We will seal off any areas of concern to contain the mold and examine the scope of any mold infestation. We often work with HVAC companies on their inspections and are highly experienced in cleaning out mold from HVAC systems. Let us remove the mold vents and clean them outside with our eco-friendly, anti-microbial cleaning solution. We use proprietary remediation blends that are non-toxic, organic, biodegradable and environmentally safe. This system, manufactured by Caltex, also serves as a mold inhibitor. Have us contain the areas affected by mold and properly wipe it down to remove and inhibit mold growth. If the ductwork itself is affected, we can make recommendations for that too. (You may need to replace it rather than allow for more mold spores to travel in your home’s air. Ask us about air purification and odor removal products. Watch how we properly seal the boxes into ceilings and walls to prevent condensation from forming, which would allow mold to thrive. Oftentimes, when we get to an HVAC mold job, we see right away that the boxes with the vents were not properly sealed in the first place. Start enjoying clean air and peace of mind! We opened this discussion noting that people often procrastinate when it comes to home projects. Mold remediation is not your typical honey-do list item. As the mold grows and spreads, potential threats to your health may be increasing as well. Some people are more sensitive to mold due to allergies and asthma, but mold can be harmful to all people. Severe reactions can include fever and shortness of breath, according to the U.S. Centers for Disease Control and Prevention. People with compromised or suppressed immune systems can be more susceptible than others to mold infections. People may also suffer from rashes, sinus infections, bronchitis and other health problems. Aside from health concerns, there are other reasons you want to prevent the spread of mold in your home. For starters, the mold can cause structural damage as it degrades building materials. The more it damages materials, the more expensive it will be to replace ductwork, walls, etc. Of course, it also looks nasty and will hurt the resale value of your home. You may be nose-blind to the smell, but your guests will notice it. We have had clients who obviously had grown accustomed to the mold scent as the mold grew, and then we walked in and could immediately smell the mold. 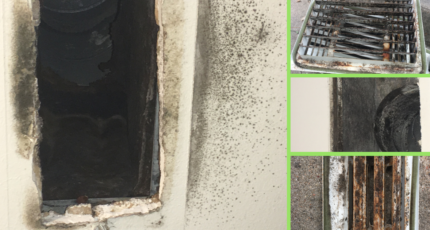 As soon as you notice mold creeping in and around your HVAC vents, contact us for an evaluation at operations@gseco.services. We know how to take care of it and cleaning up our clients’ homes makes us happy.